Mock Orange's white flowers look and smell like those of the orange, with a hint of jasmine in the scent. It is an excellent ornamental shrub. People love the contrast between its flowers and dark green leaves. 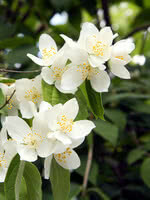 Mock Orange is suitable for planting alone or in groups as a hedge or privacy screen.